Summary: Mother’s Day should be mostly dry and warm. Watching a chance of severe weather to start the work week. Since today is a holiday I won’t keep you too long. Today our high temp will be about 88 degrees with a 10% chance of rain and thunderstorms in the afternoon. 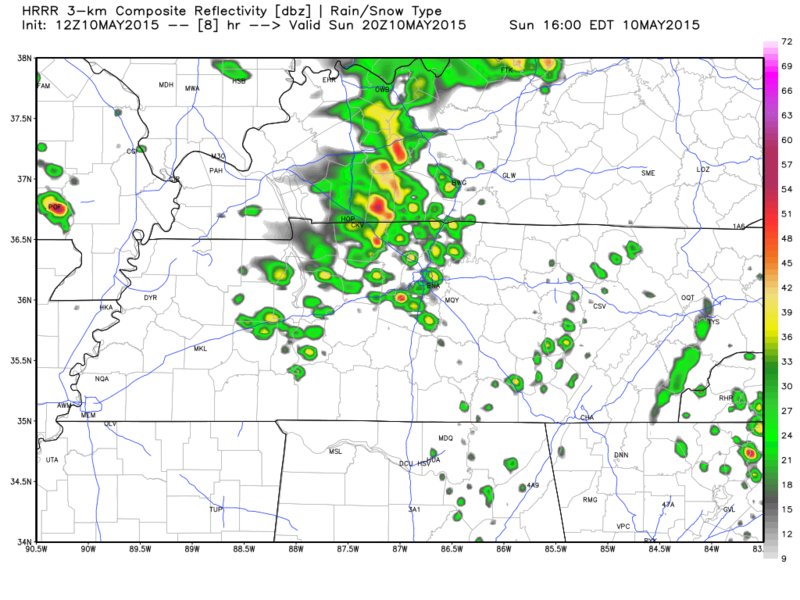 Taking a look at the HRRR model as of this post, it looks like some isolated showers may creep up around 3pm today for us, but this is just a guess. Showers could pop anywhere, but it isn’t all that likely you will get rained on today. Have an indoor plan for Mom in case you need to use it, but it doesn’t look likely you will have to (10% chance of rain). Tonight’s overnight low will fall to about 66 degrees with our rain chances doubling to 20%. We start the week with a threat of severe weather. Unfortunately after our dry run the last couple of weeks, we will start our work week with a 50% chance of rain for Monday and a high temperature reaching about 85 degrees. There is a cold front that will be working its way toward us over the weekend and is expected to cross through the Mid State sometime Monday afternoon to evening. The Storm Prediction Center has increased our outlook for severe weather for Monday at 7am through Tuesday at 7am to the ENHANCED category. West Tennessee seems to be getting the majority of the ENHANCED category, but we are right inside of their outlooked area. This means they believe we have a 30% chance of seeing severe weather within 25 miles of a point. 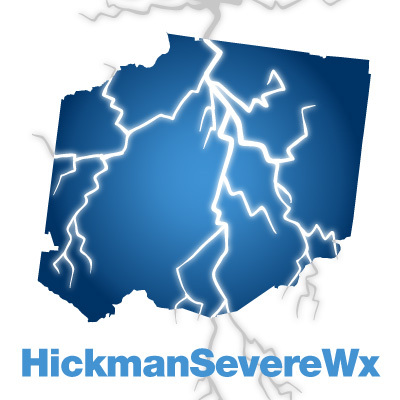 The NWSNashville has posted a HAZARDOUS WEATHER OUTLOOK for Monday as well. It appears that any strong to severe storms that produce in West Tennessee could hold together long enough to make it here and might keep their severe strength. 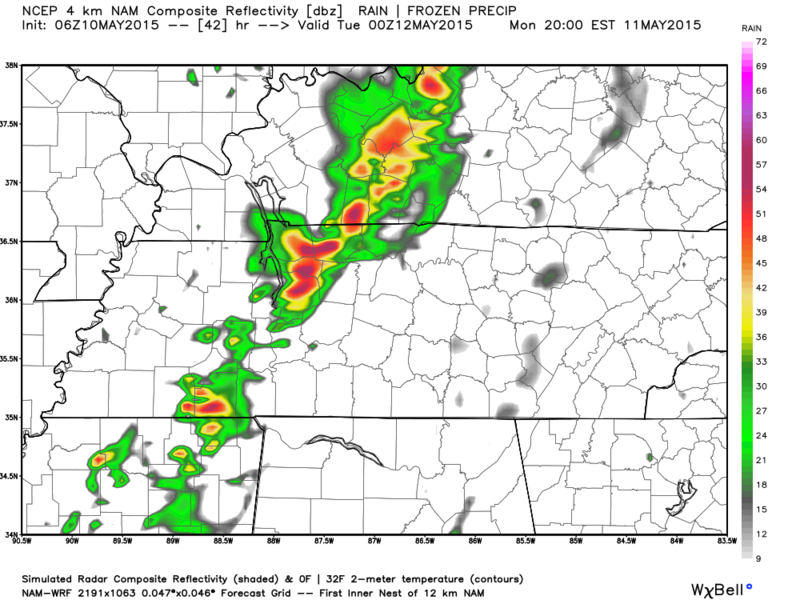 Right now the NAM4 simulated radar is wanting to say the line of showers and storms will reach Hickman County around the 6pm to 10pm time frame. Below is the simulated radar from NAM4 at 7pm. Since it is a holiday, I won’t outline all of the specifics. Since this is expected to happen later tomorrow afternoon and evening, I will write more in tomorrow morning’s post and will have much more details and updated outlook from SPC.